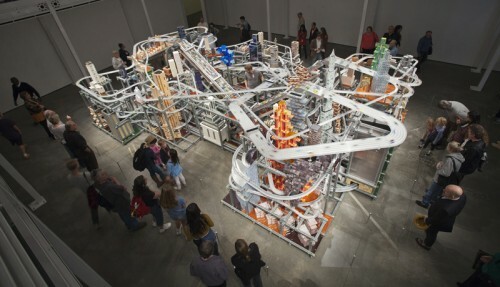 Metropolis II, opening at LACMA on January 14, is installation artist Chris Burden’s action-packed, raucous, optimistic view of Los Angeles sometime in the not-to-distant future. Eleven-hundred custom-made, die-cast cars, about twice the size of a Matchbox car, race through a multilevel system of 18 roadways that twist and turn and undulate amid buildings that seem vaguely familiar but are not replicas of any specific landmark (although, strangely, there is what looks like an Eiffel Tower). The cars whip along on a plastic roadway at fantastic speeds, producing an enormous din that echoes off the gallery walls like the incessant roar of real-life freeway traffic. HO-scale trains and 1930s-era trolley cars roll along tracks of their own, adding a cheerful nostalgia to the mix. Metropolis II—a name that invokes a fanciful makeover of the drab, congested present version of Los Angeles—is a boyish delight. Yet another in a long line of automotive utopias from the Hot Wheels that come wrapped for Christmas as committed to Walt Disney’s own autopia. It seems unfair, but you’re compelled to ask, where is the public transit that planners extol as our real future? What is the energy source for all these racing cars? And, most curious of all, where are all the people who’re supposed to be careening freely behind the wheels of all those racing cars?